Is Indianapolis Colts kicker Adam Vinatieri a genealogist? He's certainly familiar with one ancestor who narrowly avoided the fate of his patron, General George Custer. 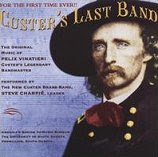 At the Vinatieri Archive of the National Music Museum you can listen to, among other tunes, Felix's "General Custer, Last Indians Campagne March"—composed just months before the General met his end.